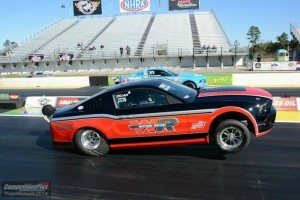 Pulling the front wheels off the ground at the start is all part of drag racing! Custom Mustang Wheelie bar is available from Watson Racing to keep your car on all four wheels down the track. Designed and developed alongside Ford Racing for the 2014 Cobra Jet drag race program! 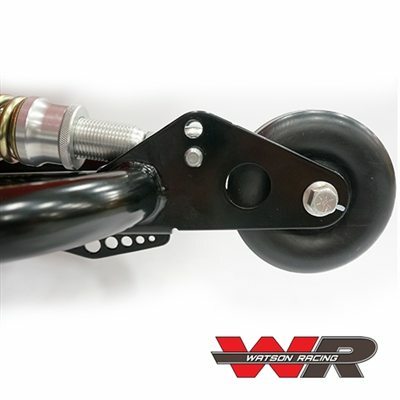 For the serious Mustang drag racer, the Watson Racing wheelie bar is designed to work with 9” rear axles only. Watson Wheelie Bar is a product of months of extensive testing and dozens upon dozens of passes down the track- no shortcuts taken here. 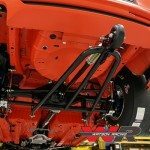 The kit includes brackets that have to be welded to your axle housing, as well as a small sheet metal “notch” that must be welded into the spare tire well, for wheelie bar clearance. Will work with any 2005-2014 Mustang (possibly other years as well) using a 9” rear axle. Constructed of CNC mandrel bent 4130 chromoly tubing, precision TIG welded in fixtures, and powder coated, all right here in Michigan. Contact Watson Racing to professionally weld the brackets to your axle housing. Watson Racing is proud to be an integral part of the Ford Racing Cobra Jet and, Boss 302S and future 2015- up Mustang S550 race car programs. 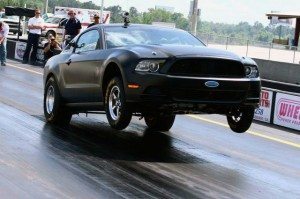 Watson works closely with the Ford Racing Engineers to build and supply many parts for the Cobra Jet and the Boss 302 S as well as prototype and testing of the new 2015 Mustang S550 race parts. Watson Racing offers its own brand of Mustang racing products, as well as, Ford Racing Performance Parts & Edelbrock E-force superchargers online at https://shop.watsonracing.com. Watson Racing offers nearly every aspect of vehicle services for almost every application. The experts at Watson can build cars from scratch or upgrade your current race or street car. 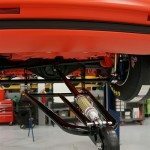 Watson produces its own line of chassis and suspension components builds and installs roll cages and safety systems. Also, Watson offers dyno tuning services from our experienced staff using our dyno jet dynamometer and SCT software- not only will Watson Racing build and improve your vehicle’s performance, but we can also validate the horsepower and improvements as well.